When it comes to decorating a space, I think throw pillows are a key element. I found a couple of pillows from Ikea and Home Goods before I moved into my apartment, but for the most part they're all pretty simple. I like to call the pillows below "statement pillows," because like a good statement necklace draws attention to an outfit, these pillows bring attention to a space. I originally saw the needlepoint Beatles pillow at my local Nordstrom, and I've been in love with the Jackie Kennedy pillow by Jonathan Adler since I first saw it around Christmas time. Would you buy one of these, or are you drawn to more simple covers when it comes to pillows? I think pillows give you the opportunity to do something drastic and make a statement without committing -- you can always switch them out! I've also been loving that Jackie O pillow for awhile! I'm kind of obsessed with that George Washington pillow! Too cute! 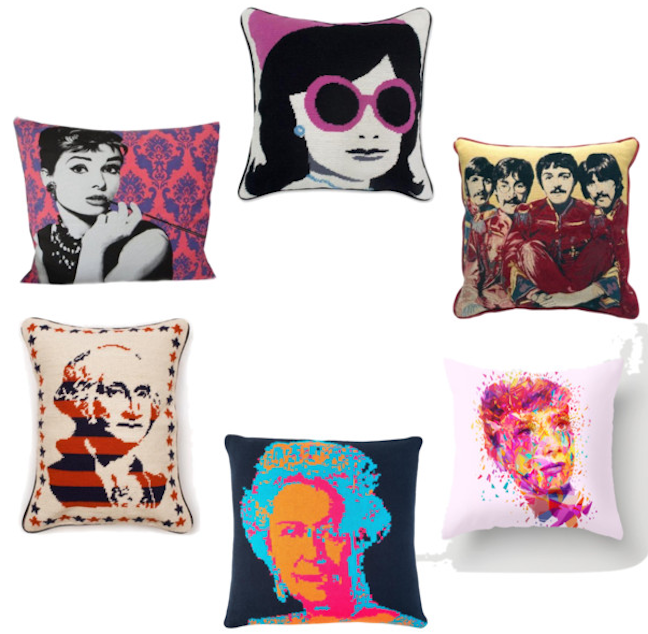 I'm loving the audrey Hepburn pillow on the left!